Ciara Mageean hopes to compete at the World Indoors in Birmingham in March before representing Northern Ireland at the Commonwealth Games a month later. Mageean finished third in the women's Wanamaker Mile at the Millrose Games in New York on Saturday night. Speaking before that race, Mageean, 25, revealed her intention to compete in the 1500m in Birmingham. "I'm living in Manchester and it would be fantastic to make the short journey up to the (World) Indoors," she said. In an interview with the FloTrack athletics website, the county Down woman said the Birmingham event would represent an ideal "stepping stone" towards the Commonwealth Games in Gold Coast. "I'm not going to put too much pressure on the indoor season but being an athlete, I'm competitive." 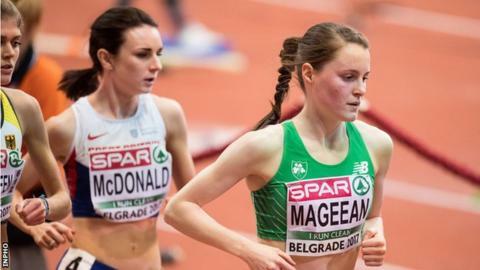 2016 European bronze medallist Mageean will be back in action on Saturday at the New Balance Indoor Games in Boston, which is another one of the top meetings on the IAAF's indoor circuit. The field will include Ethiopia's 2016 world indoor silver and bronze medallists Dawit Seyaum and Gudaf Tsegay plus Britain's Sarah McDonald. Mageean is yet to achieve the world indoor standard of 4:11.00 (mile 4:28.50) after clocking 4:30.99 in New York at the weekend. That left her behind American duo Colleen Quigley (4:30.05) and Kate Grace (4:30.08). Mageean's indoor mile best is 4:28.40 while she set an outdoor PB of 4:22.40 at last year's Anniversary Games in London. The New York outing was Mageean's first race since leaving previous coach Jerry Kiernan last November to link up with Manchester-based group of Steve Vernon. It was also her first indoor race since dropping out of the 1500m final at last year's European Indoor Championships in Belgrade. Saturday's winner Quigley races predominantly in the 3,000m steeplechase outdoors and finished eighth in the event at the 2016 Olympics in Rio. Grace won the 800m at the US Olympic trials in 2016 and was eighth in the event in the Olympic final in Rio.